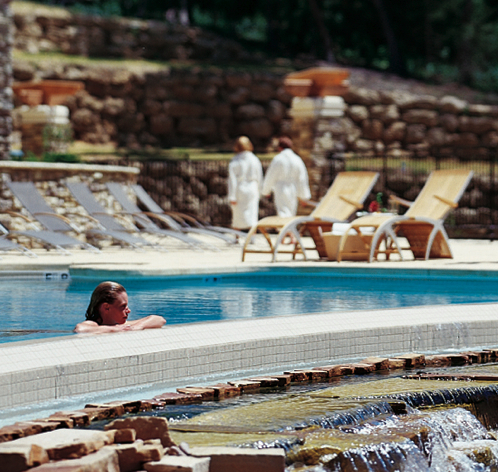 True to its origin from the Sanskrit word for ‘beautiful’, Sundara Inn & Spa is a destination spa nestled in a fragrant 26-acre pine forest in the heart of Wisconsin. Created with a respect for the environment and guided by the principles of Feng Shui, Sundara offers an unexpectedly sophisticated sanctuary from stress and a place to reconnect in the Midwest. The spa incorporates the finest organic products from around the world, while Sundara’s signature collection draws on ingredients indigenous to the area. There are 14 treatment rooms, with two ‘Spa Together’ rooms allowing for side-by-side spa treatments. 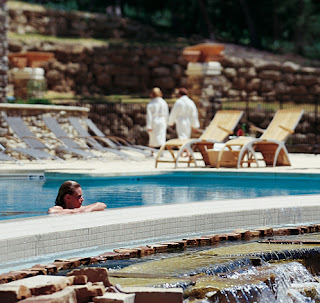 Guests may select from a full menu of massages, body treatments and facials. A full-service salon provides spa-like hair and nail treatments. Guests of Sundara may enjoy all the facility has to offer: indoor bathhouse with Purifying Bath Ritual, Relaxation Lounge overlooking the grounds, outdoor infinity pool heated year-round, and fitness facility. All-day spa cuisine is available. The Sundara's signature treatment is the Sundara Sandstone Polish Body Treatment - an invigorating treatment using Sundara’s own Sandstone Body Polish as an exfoliating agent. The sand in the product was discovered at the spa’s excavation site and its source is an ancient Cambrian-era sandstone. You are treated to a Vichy shower, then the Sundara Signature Hydrating Mist and Signature Nourishing Body Milk, leaving your skin renewed, healthy and glowing. Sundara's is one of the best in what they do and there is no doubt with that!